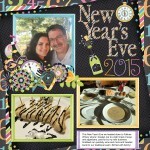 Here it is, my New Year’s Eve scrapbooking page. Everything was done using My Memories software and their Countdown Kit and Countdown Extra Monograms collections. I loved the whole set and the hardest part was picking which of the amazing elements I would use.